Deep frying is not the most desirable cooking technique. It increases calories and because of the high temperatures can destroy the heat sensitive nutrients. It is also to blame for increasing the inflammatory omega 6 fatty acid linoleic acid in the diet. However, to achieve a lightly crunchy yet pillow like texture tofu must be deep fried. There are a few techniques that may help decrease health concerns associated with this method of cooking. The superior oil choices for frying are either virgin coconut oil or olive oil, not the extra virgin versions. Both have smoke points over 400 degrees F. which will prevent the creation of acolein, a known irritant created when the fatty acids are heated past their smoke point. They also have the lowest percentage of omega 6 fatty acids. Deep frying, meaning food is submerged in the oil, cooks food faster and more evenly. This decreases the oil's opportunity to penetrate past the exterior. Less exposure to the hot oil may protect some of the heat sensitive nutrients and prevent a higher calorie content then necessary. This only works if the temperature does not fall below 350 degrees F. Choose an extra firm tofu variety for your stir fries. Because tofu is stored in water it will have to be placed between sheets of paper towel to absorb the liquid. If you are not comfortable frying for whatever reason then I suggest choosing tempeh as the protein source. Unlike tofu, a desirable texture can be achieved by first boiling and then baking. If you plan to use animal protein I strongly suggesting baking these food items as they are already higher in calories then plant equivalents. For the vegetable medley use garlic and onion for the aromatics and choose 3 other vegetables to add color, texture and nutrients. Some examples of common stir fry stars include carrots, mushrooms, bok choy, pineapple, spinach, bell peppers, bean sprouts (only garnish because they are quite delicate), baby corn, bamboo shoots, cabbage, snow peas, broccoli, water chestnuts, and zucchini. The following recipe is for 2 servings but can be adjusted as needed. Below are recipes and directions for both fried and baked versions of this dish. Choose the one that best suits your needs. Make sure to read all the directions thoroughly before beginning the cooking process as this recipe is one of the more complex. Sauce recipes can be found on the Rx meals page under the Farmacy tab. Directions for Frying : Begin by boiling water and your desired whole grain (rice, quinoa, faro) following the packages instructions. If you are unfamiliar with some of the whole grains see the Whole Grain Description page under the Farmacy tab. Keep an eye on this pot and remove from the heat and cover with a lid when finished. Remove the tofu block from the package and cut off 1/4. Return one remaining 3/4 to the refrigerator. Cut the other half into dice sized cubes. Place the cubes on top of a paper towel stacked 2 sheets thick. Place 2 more sheets folded together on the top of the tofu. Set a large sauté pan on top of the covered tofu along with a full cooking oil container or several canned vegetables for weight. Allow the paper towel to absorb the water for 40 minutes. If you are using tempeh boil for 8 minutes. In the meantime prepare your chosen sauce. 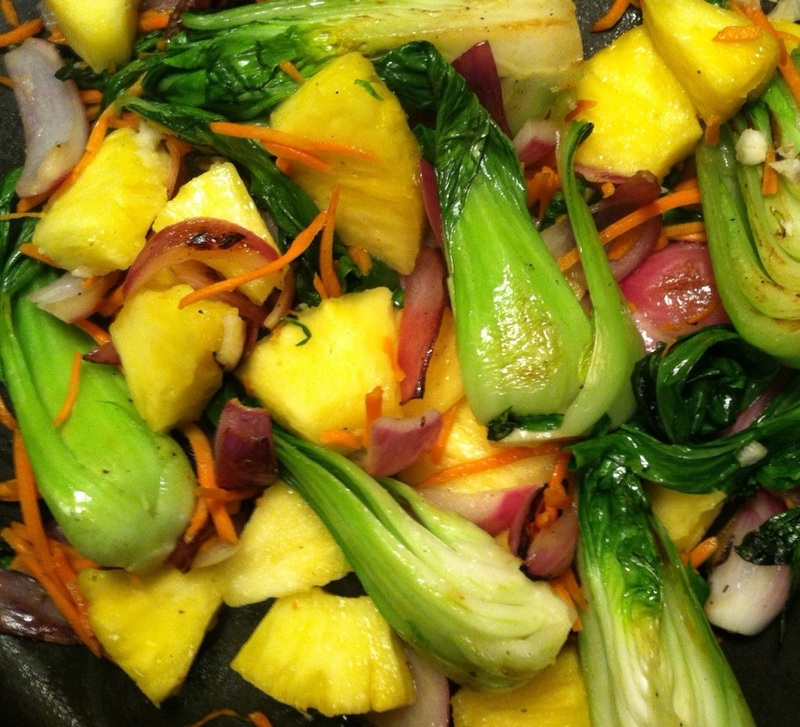 See the recipes for sauces on the Rx meals page under Stir Fry Sauces. Put 2/3 cup of the sauce in the flat dish. Wash and cut your chosen vegetables. When the tofu is dried or tempeh is done boiling marinate in the dish containing the sauce for about 20 minutes. Place the sauté pan on the stove and heat 1 tbsp. oil on medium. Add the onion to the pan and sauté until softened. Add the vegetables, garlic and salt and pepper. Mix together and allow to soften with the lid on. Using the thermometer heat the oil in the sauce pan until the heat hits between 360 - 375 degrees F. Do not allow the temperature to exceed 400 degrees F. In small batches add the tofu or tempeh and allow to cook until golden brown. Use a slotted spoon to remove the cooked tempeh or tofu and place on a paper towel to absorb the access oil. Continue adding batches until finished, making sure to not allow the temperature to drop below 350 degrees. Add the tofu or tempeh to the saute pan along with the marinade and stir everything together gently. Skip the following step for the peanut coconut sauce. While the vegetables continue to cook take a medium sauce pan and pour in the remaining sauce with 1/2 tbsp. of corn starch. Heat on medium and whisk until a thick consistency is reached. Remove from heat. Spoon in the thickened sauce and gently toss. Continue to add the sauce slowly until the desired flavor is reached. Directions for Baking: Preheat the oven to 350 degrees. Begin by boiling water and your desired whole grain (rice, quinoa, faro) following the packages instructions. If you are unfamiliar with some of the whole grains see the Whole Grain Description page under the Farmacy tab. Keep an eye on this pot and remove from the heat and cover with a lid when finished. Fill another medium sauce pan with water and bring to a boil. Add 1/2 of the tempeh block and return the other half to the refrigerator for later use. In the meantime prepare your chosen sauce. See the recipes for sauces on the Rx meals page under Stir Fry Sauces. Put 2/3 cup of the sauce in the flat dish. When the tempeh is done boiling, marinate in the dish containing the sauce for about 20 minutes. At this time wash and cut your chosen vegetables. When the tempeh is done marinating place on a baking sheet that has been lined with parchment paper and lightly greased. Bake for 25 minutes. While the tempeh bakes place the sauté pan on the stove and heat 1 tbsp. oil on medium/high heat. Add the onion to the pan and sauté until softened. Add the vegetables, garlic and salt and pepper. Mix together and allow to soften with the lid on. Keep on low heat. When the tempeh is finished baking add it to the sauté pan along with leftover marinade in the flat bottomed dish and stir everything together gently. Skip the following step for the peanut coconut sauce. While the vegetables continue to cook take a medium sauce pan and pour in the remaining sauce with 1/2 tbsp. of corn starch. Heat on medium and whisk until a thick consistency is reached. Remove from heat. Spoon in the thickened sauce and gently toss. Continue to add the sauce slowly until the desired flavor is reached.